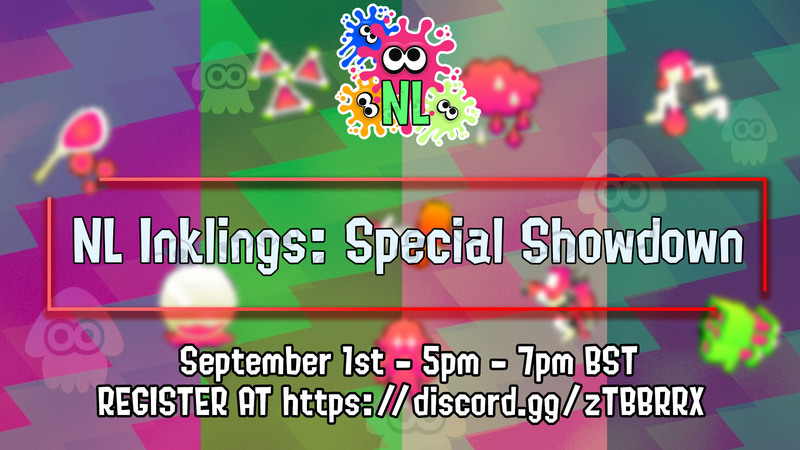 NL Inklings Community - Our September 2018 Tournament Schedule! NL Inklings Community: Our September 2018 Tournament Schedule! It’s a new month which means new a new tournament! Well…three! The structure of two tournaments per month remains, but with one more due to how the calendar worked out. The first will always be Splatoon 2, and two weeks later we will hold a tournament for a different game. In this case, we have the returning Splatoon 2 tournament…and a popular eSports title…AND a classic party favourite! Splatoon 2 – NL Inklings: Special Showdown! (September 1st 2018)! Organised by Golden, NinjaAceTrainer and newcomer to the team Agent Quinkling, we have the Special Showdown! This tournament will see teams limited to one special weapon per team. That’s right, your whole crew only gets to use weapons with a specific special! The teams are Inkjet, Splashdown, Bomb Launcher and Baller! This will be a standard Round-Robin tournament with one match played per mode, duking it out across all 5 modes. How teams are decided however…is a little different. The highest ranked players who sign up will be assigned as team captains, and then get to enter a bidding war for other entrants to join their team! Each additional entrant will get a chance to make themselves seem appealing beforehand, so don’t worry if you feel you won’t be picked! These teams can then synergise and work out what weapons and gear they wish to use, while keeping to their special restriction! 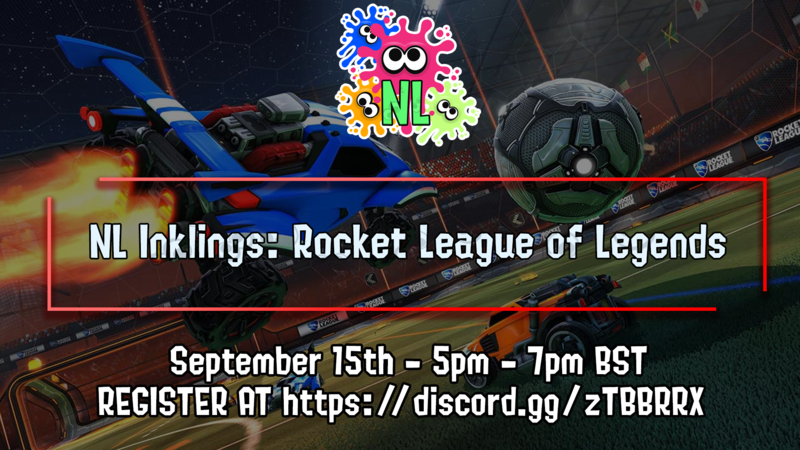 This tournament takes place on September 1st at 5pm BST sharp! Sign ups open TODAY, August 20th! Rules will be published TODAY! Sign ups will be live until Wednesday August 29th! The Auction will be held on August 30th! Rocket League – NL Inklings: Rocket League of Legends! (September 15 2018)! Thanks to Shani and Nick for organising this one! A game we are quite fond of! This popular game is going to be the subject of our second tournament! Full details will be worked out leading to the event, regarding modes and team sizes as well as format, but this will all be revealed once the Special Showdown tournament has concluded! A VERY IMPORTANT NOTE IS THAT DUE TO SONY’S CROSS PLATFORM PLAY POLICIES IN EFFECT AT THIS TIME, PS4 USERS WILL NOT BE ABLE TO PARTICIPATE! Xbox One, PC and Nintendo Switch users will be fine. This tournament takes place on September 15th at 5pm sharp! Sign Ups will go live on September 5th! Rules will be published on September 8th! Sign Ups will close on September 12th! 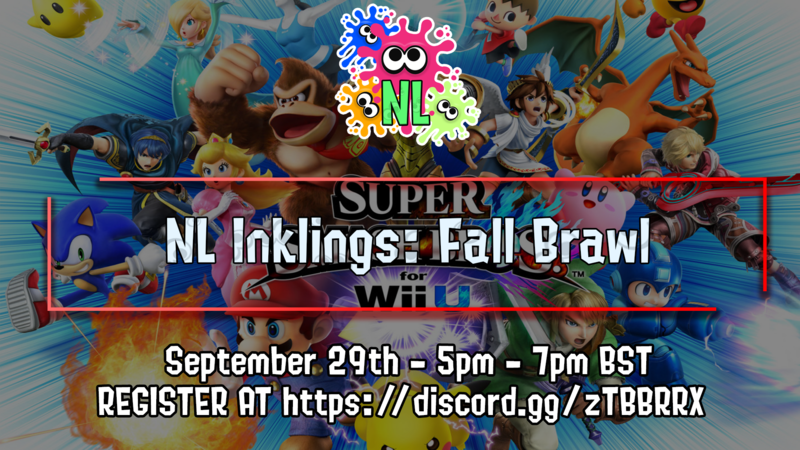 Super Smash Bros. for Wii U – NL Inklings: Fall Brawl! (September 29 2018)! The Smash Bros. Fall Brawl! Organised by Haruki and Nicolai, we are bringing Super Smash Bros. for Wii U to the forefront one final time before Ultimate releases this holiday! What better way to ring in the Fall season than by smacking around the entire Fire Emblem cast? Oh, and some other guys are here too! Full details will be worked out closer to the event, and the full reveal will be right after the Rocket League tournament! This tournament takes place on September 29th at 5pm sharp! Sign Ups will go live on September 19th! Rules will be published on September 22nd! Sign Ups will close on September 26th! That’s all for now. See you on the Splattlefield, the pitch, or in battle! NL Inklings out, Happy Gaming!